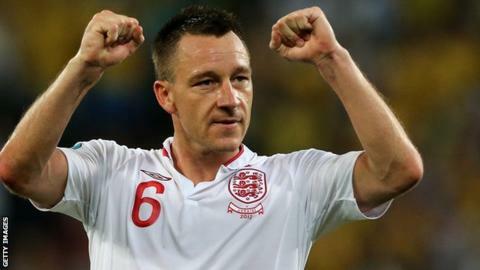 John Terry has been included in Roy Hodgson's 24-man England squad for September's World Cup qualifiers against Moldova and Ukraine. But Manchester United winger Ashley Young, who featured at Euro 2012 and in England's recent friendly against Italy, is out with a knee injury. Chelsea skipper Terry, 31, missed his side's 2-0 victory over Newcastle on Saturday with a neck injury. But he is selected alongside team-mates Daniel Sturridge and Ryan Bertrand. Sturridge, 22, and Bertrand, 23, both played against Italy and the former keeps his place as Wayne Rooney misses out as a result of the badly gashed thigh he suffered in Manchester United's 3-2 over Fulham. Rooney's United team-mate Michael Carrick could make his first competitive appearance for England since he asked not to be considered for international duty last January, having not featured at the 2010 World Cup in South Africa. Also returning to the squad is Liverpool's Steven Gerrard, who missed the Italy friendly. Arsenal forward Alex Oxlade-Chamberlain is also included, alongside his team-mate at the Emirates, Theo Walcott. Jack Rodwell, who recently joined Manchester City in a £12m deal from Everton, was instead named in Stuart Pearce's U21 squad. Birmingham goalkeeper Jack Butland and Norwich's John Ruddy will be back-up to Manchester City's Joe Hart, meaning there is no place for Queens Park Rangers' Robert Green. Young has a knee injury which will rule him out of action for club and country for two weeks. The road to Brazil 2014 begins at the Zimbru Stadium in Moldova on Friday 7 September before Hodgson's side are back in action at Wembley five days later against Ukraine. Goalkeepers: Jack Butland (Birmingham City), Joe Hart (Manchester City), John Ruddy (Norwich City). Defenders: Leighton Baines (Everton), Ryan Bertrand (Chelsea), Gary Cahill (Chelsea), Ashley Cole (Chelsea), Phil Jagielka (Everton), Glen Johnson (Liverpool), Joleon Lescott (Manchester City), John Terry (Chelsea), Kyle Walker (Tottenham Hotspur). Midfielders: Michael Carrick (Manchester United), Tom Cleverley (Manchester United), Alex Oxlade-Chamberlain (Arsenal), Steven Gerrard (Liverpool), Adam Johnson (Sunderland), Frank Lampard (Chelsea), James Milner (Manchester City), Theo Walcott (Arsenal). Forwards: Andy Carroll (Liverpool), Jermain Defoe (Tottenham Hotspur), Daniel Sturridge (Chelsea), Danny Welbeck (Manchester United).